Clublaptop 2.4 GHz Wireless Mouse for Laptop & PC (Two Skin Options) - Lapmice - Clublaptop - The largest online store by Manufacturer of Laptop Accessories and Spares. 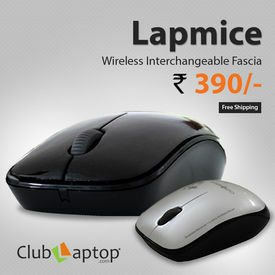 Clublaptop presents Lapmice, an advanced wireless mouse with 2.4 Ghz connectivity. This CL mouse is a perfect example of comfort along with style. Ergonomic design makes it easy to operate for longer hours where as interchangeable facia gives you a unique style statement. It comes with a tiny nano receiver and works perfectly even at a disctance of 10 mtr. PS: Battery will not be shipped due to shipping regulations. You need to purchase 1pcs AA battery seperately from any shop.